Fender Musical Instruments Corporation (FMIC) today announced the release of two ukuleles inspired by singer-songwriter Grace VanderWaal. The 2017 Billboard Rising Star award recipient popularised ukulele when she won Season 11 of NBC’s America’s Got Talent in 2016 at age 12. The Grace VanderWaal Signature Ukulele and Moonlight Ukulele were created with the classic clean, legendary Fender tone to inspire and capture hearts of the next generation of musicians. The release of these two artist signature models comes at an exciting time for VanderWaal who has just come off a summer tour with pop-rock band Imagine Dragons and is slated to make her 2019 film debut as the lead in Disney’s book-to-film adaptation of Stargirl. The performance-inspired Grace VanderWaal Signature Ukulele incorporates everything that Grace loves about playing live for her fans. From the stage-ready, Fishman® Kula preamp pickups, dark walnut exterior and custom deluxe gig bag, the instrument itself reflects Grace’s boho-chic style and mission to inspire the next generation of players. The concert body is constructed from sapele wood which gives the signature ukulele a balanced, earthy tone that serves as the perfect support for her uniquely soulful voice. VanderWaal personally selected each detail to make the ukuleles sound rich and embody her personal style, which is reflected in the custom gold hardware and rosette. In addition, her signature adorns the Telecaster headstock, as well as the custom soundhole label–the first of its kind on a Fender instrument. VanderWaal also worked with Fender to create the Grace VanderWaal Moonlight Ukulele – a navy blue- colored version of the California Coast Series Venice Soprano uke – perfect to play by the beach or at home with friends and family. It features all the same personal touches on the Signature model, but at a more accessible, entry level price point for those just beginning their musical journey. To assist players that want to follow in VanderWaal’s footsteps, Fender has included a 30-day free trial of Fender Play – the perfect companion and complete learning app for ukulele, guitar and bass–with the purchase of either signature ukulele. Six of VanderWaal’s hit songs including, “I Don’t Know My Name,” “Just a Crush,” “Clay,” “Gossip Girl,” “Light the Sky,” and “So Much More Than This,” are offered in the app’s ukulele lessons, so fans can sing and play along with VanderWaal in minutes. The Grace VanderWaal and Fender partnership also supports Grace’s efforts to bring music to under-served schools. Her foundation “Little Miracles” strives to give the gift of music to local schools and communities in the USA where music programs have been reduced or cut altogether. Fender has donated several ukuleles to this cause and will continue supporting Grace in her work with the foundation. To learn more visit GraceVanderWaal.com/LittleMiracles. Fender’s popular artist signature models are geared toward product progression and storytelling, creating instruments designed to the unique specifications of the world’s most iconic artists. 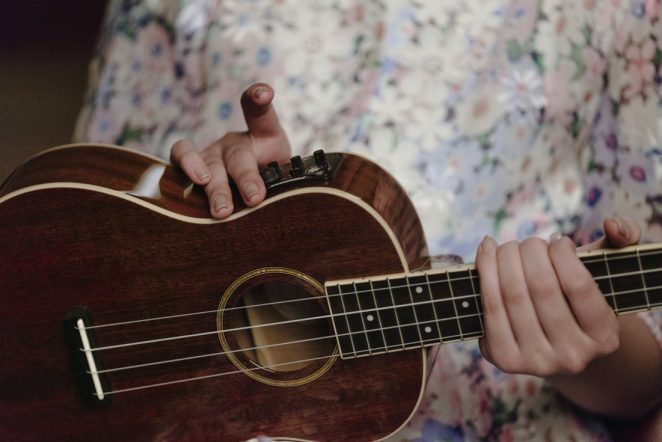 The Grace VanderWaal Signature Ukulele and Grace VanderWaal Moonlight Ukulele give fans and players at all experience levels a chance to embark or continue on their musical journey.